Ladies can be Astronauts too. 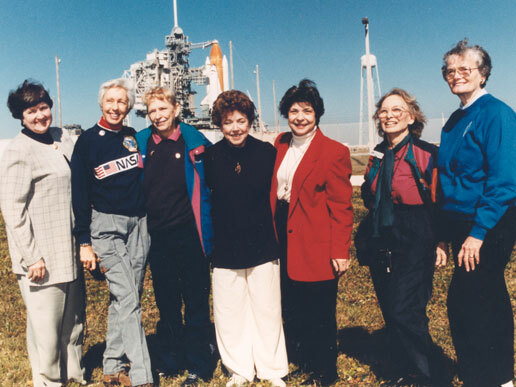 Members of the First Lady Astronaut Trainees (FLATs, also known as the “Mercury 13”), these seven women who once aspired to fly into space stand outside Launch Pad 39B near the Space Shuttle Discovery in this photograph from 1995. The so-called Mercury 13 was a group of women who trained to become astronauts for America’s first human spaceflight program in the early 1960s. Although FLATs was never an official NASA program, the commitment of these women paved the way for others who followed. Visiting the space center as invited guests of STS-63 Pilot Eileen Collins, the first female shuttle pilot and later the first female shuttle commander, are (from left): Gene Nora Jessen, Wally Funk, Jerrie Cobb, Jerri Truhill, Sarah Rutley, Myrtle Cagle and Bernice Steadman.